Social Tables — Why can't I add more than 5 events? Why can't I add more than 5 events? If you're currently using our Social Tables Free Planner Essential version you'll see you have an event limit of 5 "Active" events. No worries though, you have full control over your "Active" and "Inactive" events. 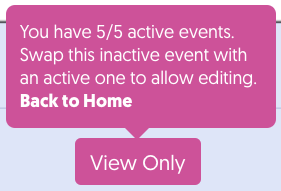 The status of your event can be adjusted in Home by clicking the "Active" or "Inactive" button. Moving an event to "Inactive" will put it into "View Only" mode. All of your amazing event information will stay right there with the event! You can chose to re-activate the event whenever you'd like!